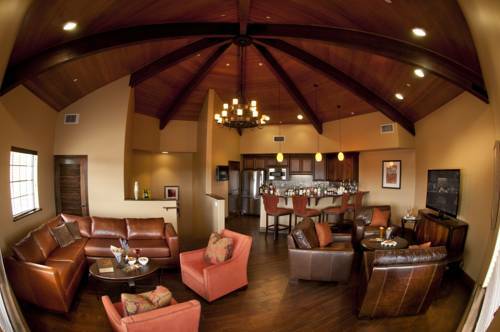 Unmatched Luxury In The Heart Of California Wine Country. Acre upon acre of sun-soaked vineyards. Lavish accommodations paired with extravagant amenities. Award-winning cuisine celebrating the finest of Napa Valleys bounty. Indulgent spa treatments in the serenity of an underground Estate Cave. The Meritage Resort and Spa perfectly blends world-class luxury with exceptional hospitality to bring you the ultimate Napa Valley resort experience. We invite you to immerse yourself in the elegant comfort of our guestrooms and suites. Each of our 322 beautifully appointed guestrooms including 12 lush suites are designed with your complete well-being in mind. Warm Tuscan-inspired decor welcomes you. Plush beds cozy robes and exclusive amenities ensure restorative tranquility and picturesque views from exclusive balconies or patios soothe as the warmth of the golden sun welcomes you to another magnificent day at The Meritage. Crush Lounge: Sports themed entertainment bar with six luxury bowling lanes pool table shuffleboard darts fireplace and dining. Siena Restaurant: Menu items arte designed to creatively reflect the Napa environment and are paired with wine from Napa/Sonoma area wineries. Fine gourmet dining specials are offered daily. Terrace Bar: Open seasonally The Terrace Bar serves up cold drinks and lighter fare with views of our hillside vineyards and the Estate Cave. Relax and enjoy refreshing fare from a cabana next to our sparkling adults only pool or on the Vineyard Terrace. Conveniently located in Southern Napa Valley at the crossroads of Highway 29 and the Silverado Trail/ across from the Napa Regional Airport.